Nestled in a chic high-rise building, this colorful Beverly Hills suite features the owner’s impressive collection of books and art, custom furniture and natural, luxurious materials throughout. Sarah Barnard, a WELL AP, LEED AP, and interior designer who specializes in health, wellness and sustaining happiness at home notes, “I adore people who are avid collectors of anything they love!” Sarah’s intuitive and personalized approach sets her apart from other designers. She has designed homes for people who have physical limitations and/or challenges, pet menageries, tree houses, art and antique collections, vegan kitchens, and for children with special needs. Her diverse body of work includes upscale private residences, chic restaurants, luxurious spas and impressive corporate headquarters. 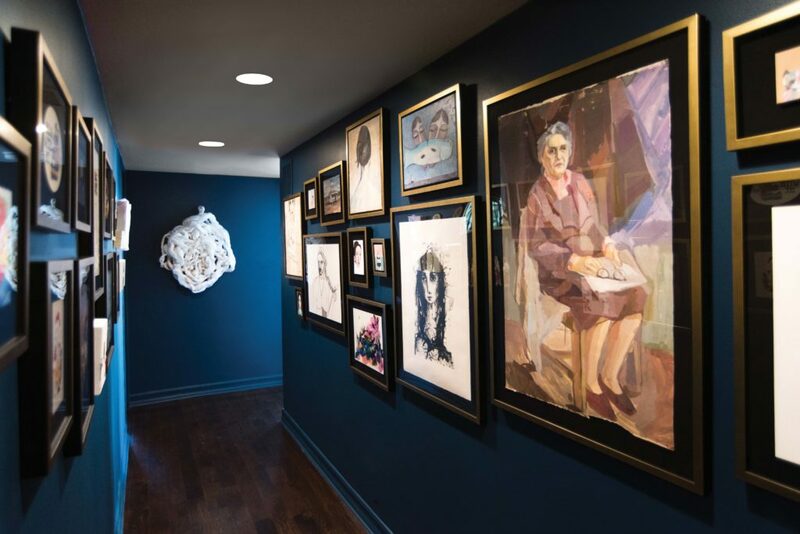 Brushed gold and black frames pop against the bold wall color and unify the homeowner’s art collection. Floor to ceiling windows on two sides of the living room reveal clear views of the city outside and are framed by a dracaena specimen and a large wall sculpture by artist Renae Barnard. Custom furniture was commissioned for the homeowner, who needed the seat height of her chairs and sofa raised to enhance its ease of use. Tillandsia, low-maintenance “air” plants, dot the space throughout and connect the indoor spaces with the open air balconies. The dining area includes custom wall-to-wall shelving, displaying the owner’s beloved collection of books, plants and sculpture. “Because my living room is surrounded by windows on two sides, I was not sure where to put bookshelves. 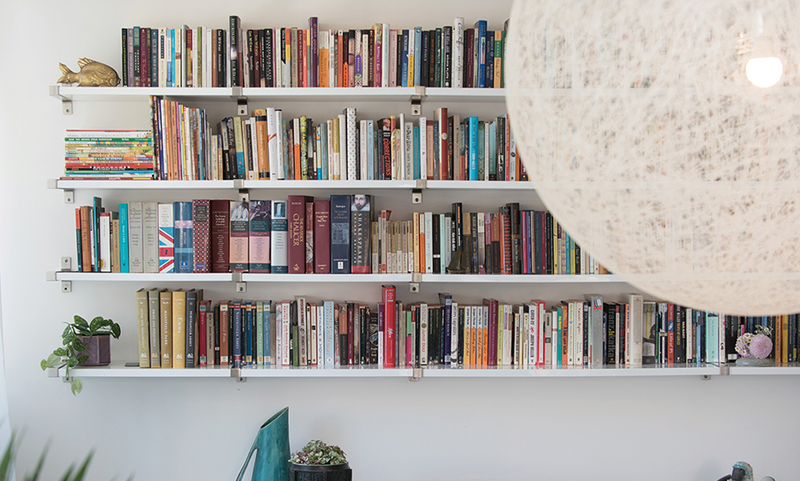 Sarah Barnard came up with the idea of displaying my books in my dining area, which satisfied my requirements of having the books easily accessible and in a prominent place,” says the homeowner, whom spends her free time reading and stitching. Living area full of organic, textural and lush materials. A wall sculpture by Renae Barnard, titled ‘Aggregate Liberty’ sits above a custom furniture piece that was commissioned for the homeowner. “We wanted her books to become a focal element and the dining area seemed like the perfect fit,” says Barnard. 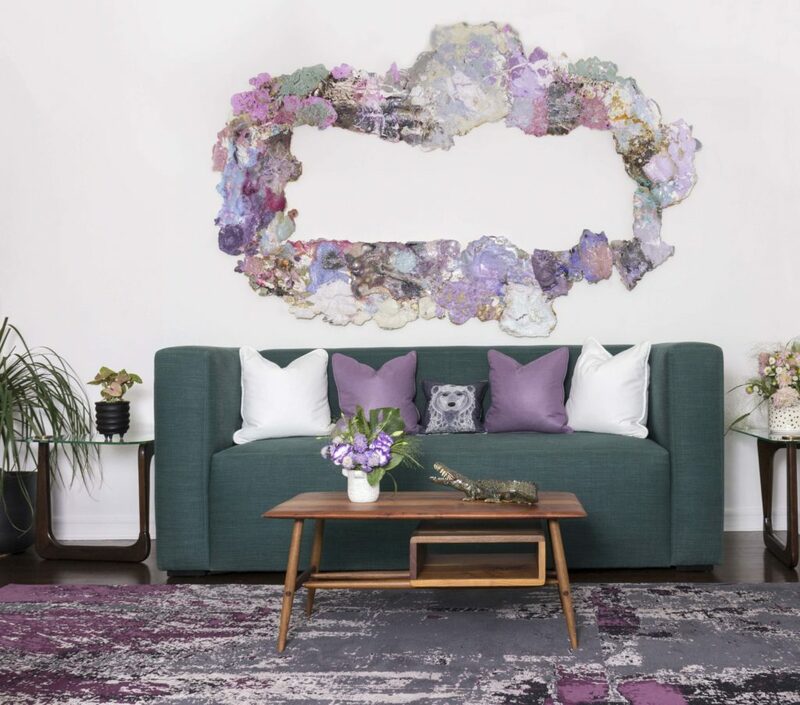 Bright blues and purples make the airy and light space feel both grounded and vibrant. Around the dining room table, a variety of vintage office chairs and a bespoke bench seat were upholstered with the same teal linen textile, allowing guests to comfortably experience their favorite seat. The bright color and mobile designs of the chairs are a fun, modern interpretation of dining furniture. A second bedroom is converted into a multi-use workspace and media room abound with personalized details. An agate-inspired grasscloth wallpaper adds a natural and organic element to the plush, achromatic office. A hand made desk in a black powder-coated steel was designed to perfectly fit the owner’s specific needs. A bookshelf was also fabricated to keep her books close at hand. Pillows embroidered with Picasso illustrations add sophisticated interest to the sleek dark sofa while a fiddle leaf fig (Ficus lyrata) adds life and color to the elegant workspace while helping to purify the indoor air. The master bedroom features a luxurious, award-winning, American black walnut bed frame by Autoban. It’s curving, handcrafted headboard is lined with purple velvet, blending natural textures with dark, feminine styling. The California king bed features an organic coconut mattress custom sized to the owner’s specifications and is outfitted with an Egyptian cotton duvet in a custom aubergine and crimson color scheme. Above it, custom neon artwork reading “phantasmagoria” adds an ethereal glow. California king bed made from award-winning, American black walnut by Autoban, lined with purple velvet, blending natural textures with dark, feminine styling. Above it, a custom neon piece reading ‘Phantasmagoria’ adds an ethereal glow. “I love unique requests and creative projects,” says Barnard, who lives for a challenge. The neon artwork was inspired by the client’s attraction to narrative language. “The neon sign in my bedroom was probably my biggest indulgence,” says the homeowner whose linguistic expertise is a defining trait. “For years, phantasmagoria had been my favorite word.” The two-tone purple wall color was specifically chosen to fulfill the owner’s request to have the bedroom ‘feel like a hug’. The secondary wall color spills up and over the ceiling creating a soothing depth and warmth. Barnard believes that your home should enhance your lifestyle and express your uniqueness. “Form truly follows function. My work is centered on health and happiness. Anything we can do to help our clients live better, we will.” Sometimes living your best life starts with the awareness and acknowledgement of your personal space. Barnard’s team helps homeowners design personalized, enduring spaces. The Sarah Barnard Design team is made up of diverse individuals who pride themselves on meeting people where they are with the belief that an authentic home has the potential to be truly restorative and inspiring. To learn more about Sarah Barnard Design visit sarahbarnard.com. Photography by Steven Dewall and Abby Siniscal.